If Barry Manilow writes the songs that make the whole world sing, David Gedge pens the songs that make the world drunk dial their ex’s after punching a hole in the wall. For over three decades Gedge has been crafting compelling and bruising songs about heartbreak, desire, infidelity, and personal frustrations as the frontman for The Wedding Present. He’s the eternal fixed center of the band, whose lineup and sound shifts from album to album. Emerging in 1985 from Leeds, England, The Wedding Present were initially lumped in with the lo-fi “C86” twee-pop scene due to their wiry, chiming guitar sound and Gedge’s unpolished vocals. They quickly outgrew that C86 label, morphing into a band that could pull off dreamy soundscapes and noisy squalls as capably as any shoegaze band. And with Cinerama, his other band, Gedge embraced a more lush, orchestral pop sound. While The Wedding Present have continued to advance their sound over the course of their discography, they’ve also gone back to their roots for a series of anniversary tours where they’ve played beloved albums like George Best, Bizarro, and Seamonsters in their entirety. Gedge and company are about to embark on another sweeping tour of the U.S. this month. One of their reasons for hitting the road is to help spread the word about director Andrew Jezard’s upcoming documentary, Something Left Behind, which chronicles the making of their seminal debut album, George Best. Considering the emotional intensity of his lyrics and music, one could assume that Gedge might be dour or withdrawn in conversation. To the contrary, speaking to the cult songwriter via phone, he comes off as warm and affable. He may be the English poet laureate of romantic angst, but he isn’t afraid to laugh at himself or chuckle about the absurdities that come with living a creative life. Aquarium Drunkard: I wanted to start off by talking about Something Left Behind, the documentary that’s being made about the making of George Best. How did that whole project come about? David Gedge: It was a friend of our first drummer, Shaun Charman, who was in the band when we made that LP. Ten years ago, when we did a twentieth anniversary tour of George Best in the UK, they had come along: Shaun and his friend Andrew, who’s a filmmaker. I think Andrew was inspired by that concert. Seeing the album being played and seeing all the fans of it who were there… I think that inspired the idea of making a documentary about the making of the record. He contacted me; initially, he was going to go with a different approach that focused on the fans and how they grew up with the album over the years. But then I said to him, ‘it’s a music documentary, you gotta talk to the people who made the record- the producer and stuff like that’. And so the brief kinda expanded. I gave him my address book, basically, and he contacted all the original members of the band – he even went to Australia, because that’s where our original bassist lives now. He interviewed them, he interviewed DJs, he interviewed quite a few people we’ve worked with over the years. It became quite a big project. So he’s releasing it in the spring, I think. He’s going to do a couple of test screenings while we’re in North America – one in Atlanta and one in Toronto. I think he’s aiming to send it out to some film festivals over the summer. It’s very exciting. Aquarium Drunkard: Taking part in a documentary like this is only one of the many ways you’ve revisited your past history. 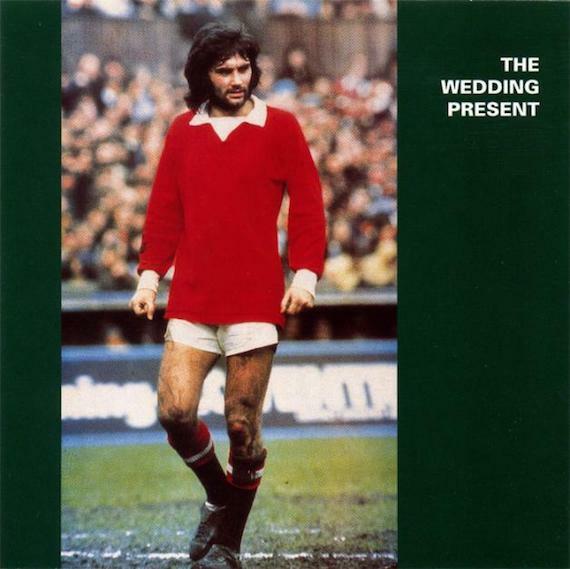 The Wedding Present has done a few album anniversary tours for records like George Best, Bizarro, and Seamonsters. You even re-recorded the George Best LP in its entirety with Steve Albini. And yet you’re also a band that’s constantly pushing forward and evolving your sound with each new record. What it’s like to dig into your back catalog after all this time? Is it hard to get back into the frame of mind of who you were when you first wrote and recorded those albums? David Gedge: That’s a very interesting question because it’s kind of a yes and a no. Part of it is that as soon as we start looking at an old song, rereading the words, figuring out how we used to play it – I feel like we’re right back there, like those thirty years that passed never happened. As I relearn the words, I find that they’re still in there, somewhere in the dark recesses of my mind. It’s very strange, how much of it I can still remember. On the other hand, it does feel like the work of a different person, yeah. It’s almost like reading an old diary. It’s like reading an entry you wrote thirty odd years ago and thinking ‘oh, I wouldn’t have done that now, I wouldn’t have written that now.’ Even though there’s some familiarity, even though you recognize yourself, you become aware that you’ve moved on and changed as a person. It’s quite surreal, in many ways. Especially now that there’s a different lineup. To them, it’s like they’re covering an album – they’re not reliving it. It’s all new to them, so it’s interesting to see how they react to it. David Gedge: Yeah, totally. It’s like when we do cover versions – you start to appreciate different styles of writing and arranging. Sometimes you can apply that back to what you do. So when we’re doing old stuff, there’s certainly times where I think “oh god, yeah, we should do that kind of sound or that kind of arranging again.” Like on the last LP, Going, Going…, which came out a couple of years ago, even though it’s quite a different sound and unlike any other record we’ve done, there are references on there to some of our previous records. Little lyrical and musical references. There’s even some references there to Cinerama, my other band. And that probably came about because we had to reimagine some of our earlier works. Aquarium Drunkard: That last album is fascinating to me. Not just for how much of a departure it is, sonically, from your older work but for the visual accompaniments you made for the record. A different video for each song. It’s interesting that you did this kind of “visual album” experiment around the same time that people like Beyonce were trying it out in the pop world. What inspired you to play around with this kind of format? I hit on this idea of basing it around a road trip and taking the titles of the songs from the places we visited in twenty states across America. And it expanded from there – we took films and photographs and it became a double LP, which I didn’t expect it to be! It was a new thing for us because we had never done a double LP before. The weight of the music and the ideas on there, the whole thing became this all-encompassing project. It’s why it took so long to assemble. Aquarium Drunkard: Are you working on any new material at the moment? Aquarium Drunkard: Was it the Tales From The Wedding Present comics? David Gedge: No, that’s a separate thing. I write those. Those are autobiographies. This book was assembled by an editor in England. He basically asked people to share their stories about our band – celebrities, fans, DJs, other bands… Ah, yes! It’s called The Wedding Present: Sometimes These Words Just Don’t Have To Be Said. Aquarium Drunkard: Considering your huge body of work, how do you go about putting together set lists for your tours? Do you try to do a cross-section of all your work, or do you focus on spotlighting certain eras from the band? How do you distill all those albums into 80-plus minutes onstage? David Gedge: The simple answer is: I don’t do it! [Laughs] Our drummer, Charles Layton, he does the setlists. I’m really glad he does. It’s like you said – it’s a daunting task. There’s getting on 300 songs we’ve got in our catalog and he’s got to whittle that down to fit into a set. And no matter what you end up playing, at the end of the night there’s always going to be someone who comes up and goes, ‘that was a brilliant gig, I really enjoyed it, but why didn’t you play the 280 other songs that you haven’t played?” It’s not just about playing the songs everyone knows, it’s about structure, it’s about giving it a proper flow from beginning to end. Charles like to surprise people and throw in more obscure B-sides. Aquarium Drunkard: This is kind of a random question to end on, but this is something I’ve always wondered about. When y’all were making me Seamonsters, were you inspired by shoegaze at the time? There’s a quality to the guitars on that record that immediately makes me think of shoegaze. I know nothing about this artist, but this intro line has me looking into their whole catalog as we speak. Nice one yet again, A.D.! You outlasted all of my other go-to blogs combined.